Included in the wealth of data provided by the NC State Board of Elections & Ethics Enforcement is a spreadsheet containing information on voters who have changed their party registration so far in 2018. 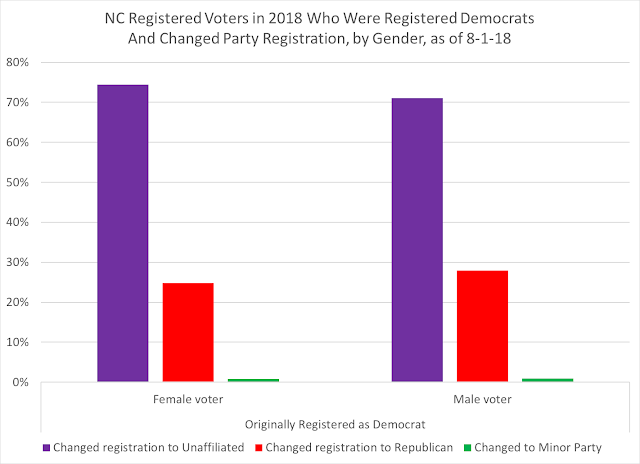 In looking at the data, there are over 660 voters who changed their voter registration and then changed back, sometimes on the same day. 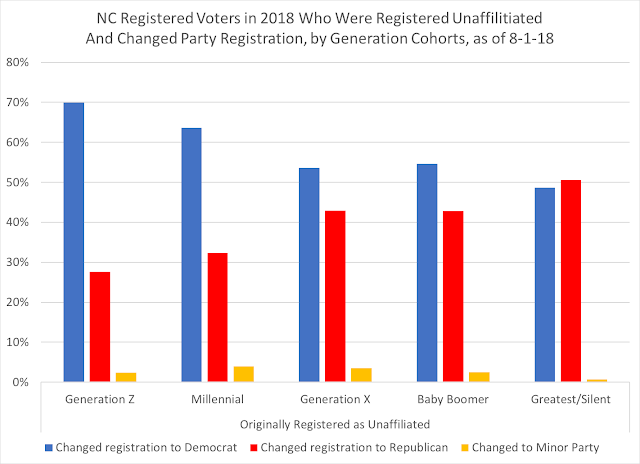 For example, a voter in Cherokee County, who in May, switched party registration from Unaffiliated to Democratic, and then Democratic back to Unaffiliated--on the same day. Needless to say, these "short-term" switchers are not included in the final data analysis; there may be a few of this short-term switchers who finally did do a true party switch, but I'll stare at my computer screen and hunt for those at a later time. 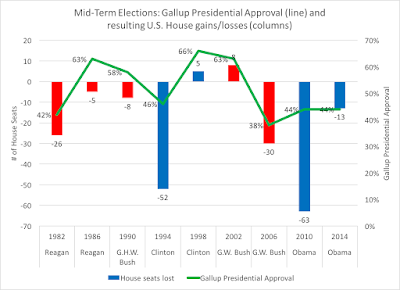 Of the voters who switched parties, 45 percent of them were formerly registered as Democrats, 29 percent were registered as Republicans, and 25 percent of them were registered unaffiliated. The registration that benefited the most, not surprisingly, was the unaffiliated category, with 57 percent, while 21 percent switched to Republicans and 20 percent switched to Democratic registration. 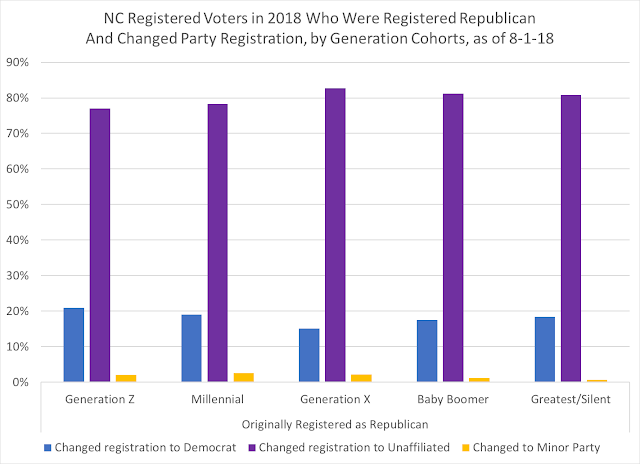 To begin with, I broke this data set into two primary categories: by generational cohorts and by gender, with a look at how younger versus older voters behaved in switching their party registration, and if gender showed any differences between women and men in switching their party registrations. Among generational cohorts, 36 percent of the party switchers were voters under the age of 37 (members of the Millennial and Generation Z cohorts), while 26 percent were Generation X, 31 percent were Baby Boomers, and 8 percent were among the Greatest/Silent generations. Younger generations were much more likely to go unaffiliated, while older voters were more prone to switch from Democratic to Republican. 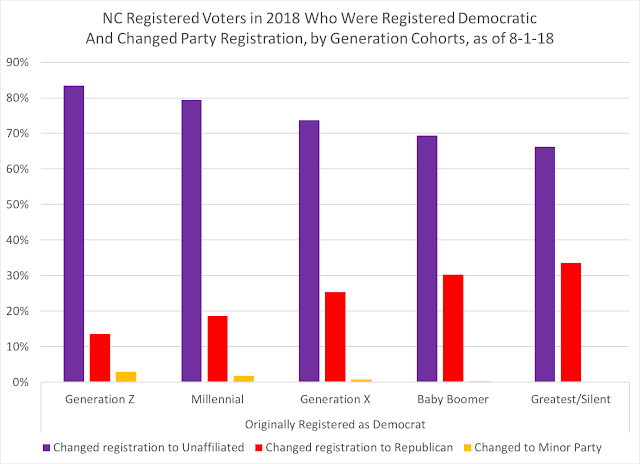 Younger voters, Generation Z and Millennials, were more likely to register as Democratic, while the oldest voters, the Greatest and Silent generations, were equally dispersed between the two major parties from an unaffiliated status. 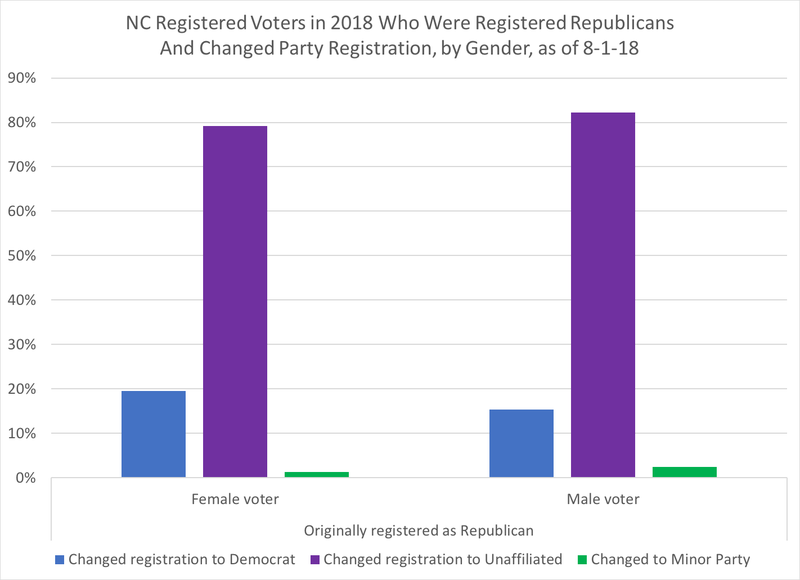 Men tended to have a slight more Republican switch from their previous Democratic registration in comparison to women, but not by much (28 percent of Democratic men going to the GOP compared to 25 percent of Democratic women going to the GOP). 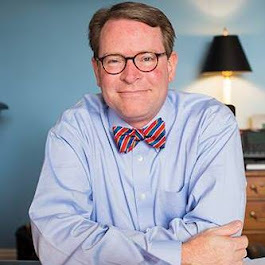 However, 70 percent or more of both formerly registered Democratic men and women went to unaffiliated party status. Conversely, women tended to go slightly more Democratic than men, but only a few points (19 percent of women registered Democratic from Republican, while 15 percent of formerly GOP-registered men went to the Democrats). Again, like their opposite partisans, significant numbers of formerly registered Republicans went unaffiliated among both genders. Nearly two-thirds of formerly registered unaffiliated women registered with the Democratic Party, while one third registered with the Republicans. 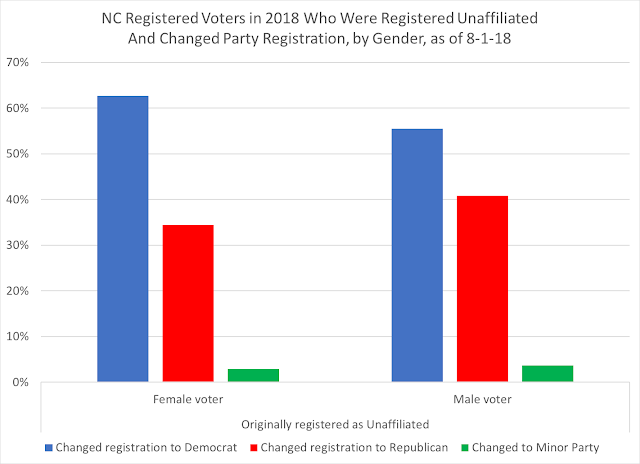 Conversely, 55 percent of formerly registered unaffiliated men registered Democratic, with 41 percent registering with as Republican (the remaining percentages went to one of the three minor parties). While the overall percentage of party switchers is small (less than 1 percent among the 6.9 million registered voters in the Old North State), this information presents some intriguing trends among the voters in North Carolina and how some voters may enter new political affiliations (or lack thereof with unaffiliated status) in their voter registration.